“Game On: Emerging Interactive Technology for Research and Teaching," set for Tuesday, Nov. 1, features film and media studies professors Daniel Reynolds and Tanine Allison. “Game On: Emerging Interactive Technology for Research and Teaching” is the title of latest Life of the Mind lecture, set for Tuesday, Nov. 1, at 4 p.m. in the Jones Room of the Woodruff Library. Life of the Mind, an informal faculty discussion for a wide audience, is free and open to the public. “This is an especially intriguing subject, featuring two young faculty members, Tanine Allison and Dan Reynolds, discussing the use of video games in their research and teaching,” says Tom Jenkins, senior director for academic and strategic initiatives in the Office of the Provost. Allison researches how first-person shooter games open up new representations of war that are lacking in cinema, and she uses these games in class to explore violent media, gaming cultures and the military-industrial-entertainment complex. “My research specifically addresses how the violence of combat video games reflects changing attitudes toward war,” says Allison. Reynolds researches the relationships between media and the mind, focusing on what film and video games can tell us about perception and consciousness. “Media provide opportunities for rethinking our relationships with the world. People tend to think of media use as withdrawing from the world, or of experiences of media as being unreal or not serious,” Reynolds says. “In my work, I push against that idea by thinking of media use as experience in the world, of the world. This means that we need to take media use very seriously as a form of bodily, psychological experience," he explains. "It also means that using media, making media and theorizing about media are all ways of doing speculative research on the human mind." 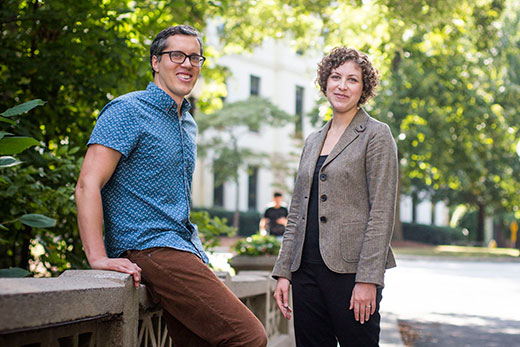 Both Allison and Reynolds are assistant professors in the Department of Film and Media Studies; Reynolds is a Mellon Faculty Fellow. Allison and Reynolds’ talk will be introduced by Matthew Bernstein, Goodrich C. White Professor and Chair of the Department of Film and Media Studies. Sponsored by the Office of the President and the Office of the Provost, the Life of the Mind series celebrates Emory’s outstanding faculty and the dynamic intellectual community of the University.